California is known throughout the country for its passenger trains — and its traffic jams. The city of Martinez is the perfect location to get away for a day on Amtrak, with 42 daily passenger trains scheduled to stop on weekdays. Those trains connect Martinez to Oakland, Sacramento, Stockton, Fresno, and many other cities within day-trip range. 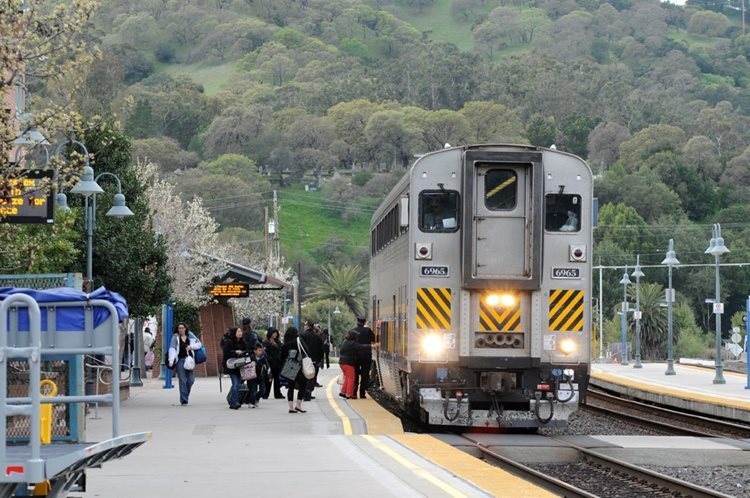 Because of this abundance of connectivity, out-of-state visitors to California can find a vacation within a vacation with a day trip to Martinez, without fighting freeway traffic. Martinez is a city of 35,000 located along the Carquinez Strait, about 30 miles east of San Francisco. Its downtown, adjacent to the Amtrak station, contains many preserved buildings, which provide a glimpse into California’s rich history. The city was also once home to famed preservationist John Muir, father of Yosemite National park. Martinez also claims to be the birthplace of the martini. 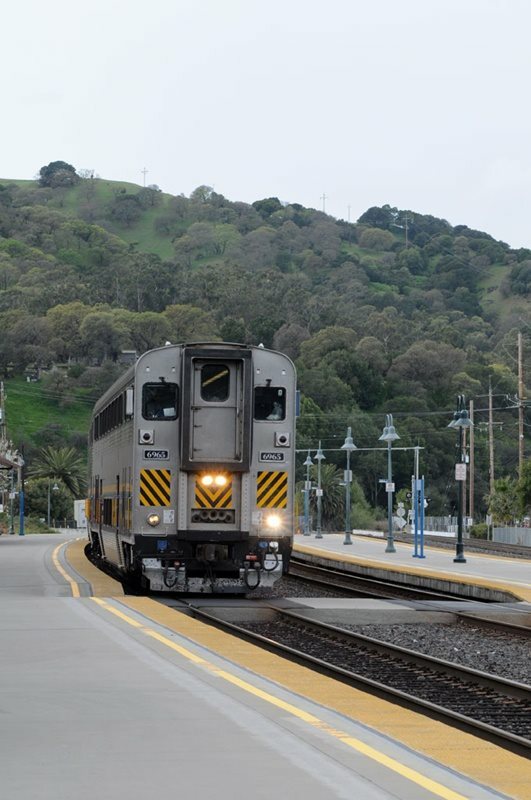 Much of the rail traffic through Martinez is passenger, both long-distance and state-supported service. This makes train-watching in the city particularly easy: Just follow the timetable! 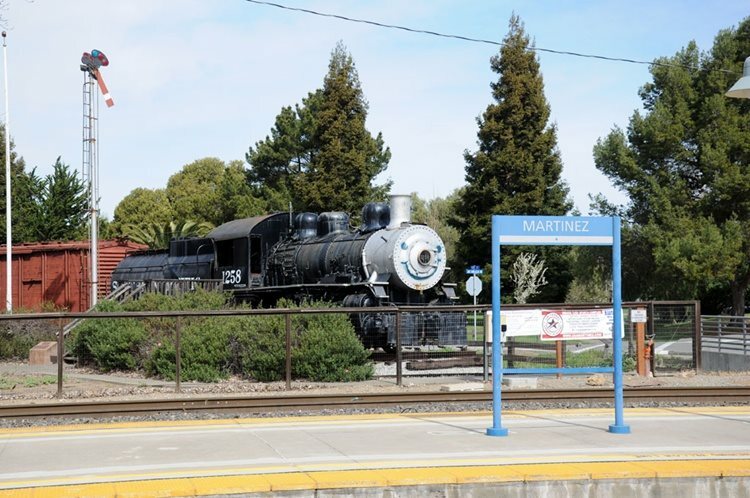 Martinez hosts 15 Capitol Corridor round trips on weekdays and four daily San Joaquin round trips, plus the daily California Zephyr and Coast Starlight. (On weekends and holidays the Capitol Corridor runs 11 daily round trips.) The first train arrives at 5:30 a.m. and the last departs at 10:54 p.m. The Amtrak station is located at milepost 31.7 on Union Pacific’s Martinez Subdivision. This former Southern Pacific line runs between Oakland and Roseville. Just east of the station there is a junction with the Tracy Subdivision, which runs to its namesake city. UP runs about eight freight trains through Martinez in 24 hours, mostly traffic to or from the Oakland area. Several photography angles are available at the station and nearby grade crossings. The city owns former Southern Pacific 0-6-0 No. 1258, displayed near the Amtrak station. The Martinez History Museum (www.martinezhistory.org) offers exhibits and walking tours throughout the downtown area. The Martinez Waterfront Park and Martinez Regional Shoreline, part of the East Bay Regional Park District (www.ebparks.org), offer additional recreational activities near the Amtrak station. Adventurous visitors can walk to the end of the fishing pier and watch ships from all over the world dock in the strait.